Dimensions: 15.7" x 15.7" x 23.6"
It's a simple truth that any airbrush job is much easier to do in silence than under accompaniment of noisy air compressor humming. And you're absolutely right that you don't want to put up with this. Because Silentaire Technologies offers a wide range of quiet and, no less importantly, powerful airbrush compressors like this Silentaire Sil-Air 50-24 Compressor. Due to the long history and modern production methods the company has become the largest manufacturer of silent running compressors and a leader in the industry worldwide. Besides, the company is constantly working on the improvement of their products to make them even more efficient and reliable. Among Silentaire compressors, you can surely find the perfect fit for your application. For this reason, the company carries a large selection of different compressor models that are designed to meet all various specific requirements of customers. In addition to the above mentioned benefits of Silentaire compressors, the Sil-Air series is also credited with the virtually noiseless and completely automatic operation. So, the noise level of even the largest Sil-Air Compressors doesn't exceed 44 Decibels, which is in fact very quiet. This significantly facilitates the work conditions and allows you to concentrate better on your project. As for the automatic functioning of such units, it is an excellent feature for preventing overheat of the device. With the growing pressure within the air tank, the compressor gets warm and then the automatic switch stops the motor. Further, when the pressure level drops to the minimum level and the compressor cools down, the switch automatically starts the motor again. carrying handle or built-in wheels providing easy portability. 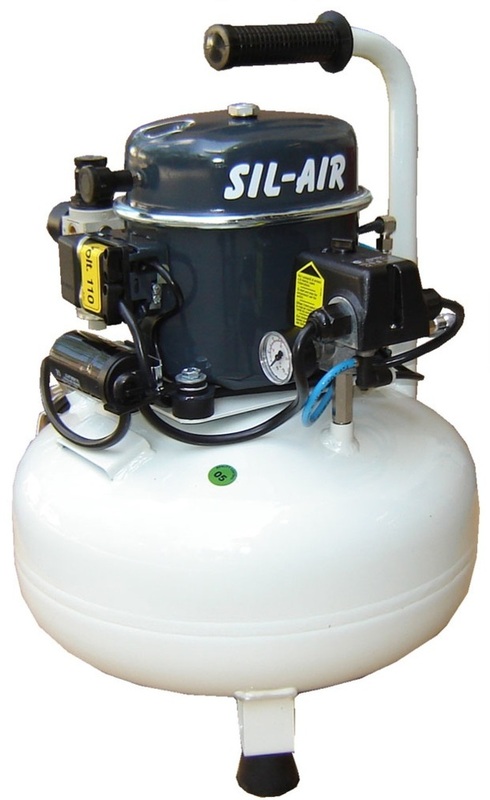 As a piece of the Sil-Air series, the Silentaire Sil-Air 50-15 features all those characteristics inherent in this product line. However, this compressor has some unique features that make it special among others. And what's so special about it is its powerful 1/2 HP motor that along with the 6 Gallon tank makes it possible for three artists to work simultaneously using one compressor. Above that, the Sil-Air 50-15 has at its disposal a heat-spreading cast iron motor. With it, the compressor can run longer with fewer shut-offs and without derating. Additionally, the compressor comes with an oil bottle type ROLOIL - SINCOM/32E, instruction manual, and a tank certificate. The 12-months guarantee from the manufacturer is available from the date of purchase. Under its terms, you have the right to have defective parts repaired or replaced free of charge. But it must be said that the electric parts and worn parts are out of the scope of the guarantee. You should also note that tampering or bad usage will void the guarantee. 25" x 17" x 17"